Peanut butter is more than just delicious, it's a dieter's best friend, too. In the video above by Knowmore TV, we get a closer look at four health benefits of eating peanut butter. Eating as little as two tablespoons a day, five days a week, can lower your diabetes risk by as much as 30 per cent. And those two small tablespoons pack a whole lot of protein in one punch — seven grams to be exact. Though peanut butter is high in calories and fat, that isn't a bad a thing. Because of peanut butter's high quantity of protein and fibre, the nut spread keeps you fuller, longer meaning you're more likely to eat less and lose more. 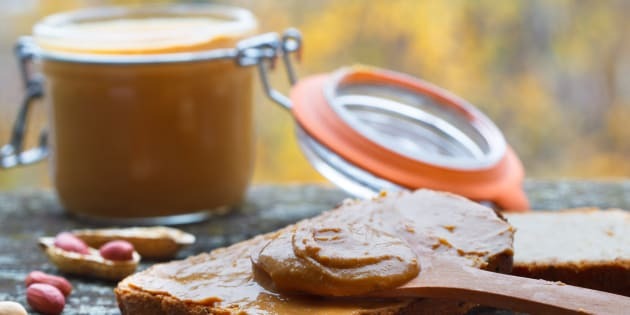 And peanut butter isn't just packed with protein — a single serving is also rich in vitamin E, magnesium, vitamin B6 and potassium, Prevention.com reports. Watch the video above to find out more ways peanut butter keeps you healthy. And check out the slideshow below for a closer look at the nutrition labels on your favourite jar of peanut butter.